I first attended a Rush concert when the band played Newcastle City Hall on their first UK tour in 1977, a few weeks before my 17th birthday. I was already a massive fan, and I’ve been to see them on each of their visits to the UK since then. The main purpose of going in recent years though has been to make sure I “have the set” of British tours, and that was my foremost thought when, in May last year, I bought a ticket to see the band on their 2013 tour, in Manchester. But a few weeks after my ticket was ordered, the band released Clockwork Angels, by a huge distance their best album for at least twenty-five years, and probably thirty. I found myself looking forward to this tour with the sort of enthusiasm I hadn’t felt since the Signals tour in 1982, and bought a ticket for a second concert when a number of decent seats at Sheffield Arena became available a few months later. In the weeks leading up to the start of the tour, my Rush-conversant Facebook friends and I had built a remarkable sense of anticipation by discussing the forthcoming tour online endlessly. I’d run a sort of Rush tour ‘advent calendar’ by posting photos I’d taken from the front row on their 2011 Time Machine tour to count down each of the last twenty days before the Manchester show, the first night. At 12:30pm on 22nd May, having eyed the clock excitedly all morning, I logged out of my computer, carried an overnight bag to the car then drove off in the direction of Greater Manchester. About eighty miles later I’d arrived in Altrincham, where I parked the car and bought a tram ticket to Manchester’s Victoria Station, a short distance from my hotel. The ride into the city should have taken no longer than twenty minutes. Thanks to a signal failure requiring every driver on the route to ask permission to cross a red light, it took about forty. But I found the hotel quickly after arriving and it wasn’t long before I’d checked in, dumped my bag and set off in pursuit of a gathering of Rush chums at a pub on Deansgate. The Moon Under Water holds one happy memory for me in particular – I first met my Finnish girlfriend Sari there at a similar gathering before a Rush concert in 2004 and I hadn’t been back there since, so it was quite a sentimental occasion for me. An assortment of friends from the Internet Rush community was already present as I arrived, so I ordered a beer and got stuck into the important business of discussing the merits of various Rush records and the inadequacies of certain other Rush fans of our mutual acquaintance, who weren’t of course present. I’d also arranged to meet there my old school chum Barry, a fellow veteran of Rush gigs at Newcastle in the ’70s, and I was delighted to see him arrive an hour later. I hadn’t seen him since 1985, so we had quite a lot of catching up to do. I was pleased to find that age had not mellowed him and amused to discover that thirty years of living in Liverpool had furnished him with a pronounced Merseyside accent. Shortly after 7pm, we left the cosy confines of the pub to stroll along to the venue, the Manchester Evening News Arena. I took my fourth row seat and spent a few minutes chatting and waving to familiar faces in the audience nearby. Finally the lights went down at around 7:40pm, the ridiculous intro film appeared, and the band took the stage. A present-day Rush performance is a very different proposition than it was when I was first a fan. I used to loathe the American habit of using the word “show” to refer to a rock concert. But these days, certainly for Rush anyway, that’s exactly what it is. A huge arena. Long and annoying comedy videos. Elaborate stage sets, animated screens, a massive light show. Instrumental passages, harmonies and backing vocals being performed by recordings; everything choreographed to nanosecond accuracy, synchronised to a click track. Members of the road crew appearing randomly on stage in bizarre costumes from time to time, in the relentless pursuit of entertainment. A rotating drum kit. And a string section! It couldn’t really be more showbiz if Fred Astaire and Ginger Rogers came on to tap dance during the encore and to be frank, it is not really the experience of a real band playing live music that it used to be a few decades ago. Nonetheless, they are still entirely capable of virtuoso performances of impressive energy for a three piece band with a collective age of 180. The big surprise for me was the selection of songs, which was essentially a showcase of their ’80s material in the first set, and of their new album in the second. I enjoyed both sets very much. But their absolute best material from the apex of their career in the late ’70s was almost completely ignored. In fact it was fully THREE HOURS after the band took the stage before they played the one, solitary ’70s tune of the evening. For one who attended stellar Rush concerts in the ’70s, that seemed a little sad. This was certainly not a concert for the connoisseur; frankly there’s no doubt at all that the setlist at my first Rush concert in 1977, when the three young Canadians had four studio albums from which to choose material, was stronger than this one, after nineteen. Of course Geddy struggles these days with the material they recorded in their twenties, with its famously energetic and improbably high-pitched vocal delivery. 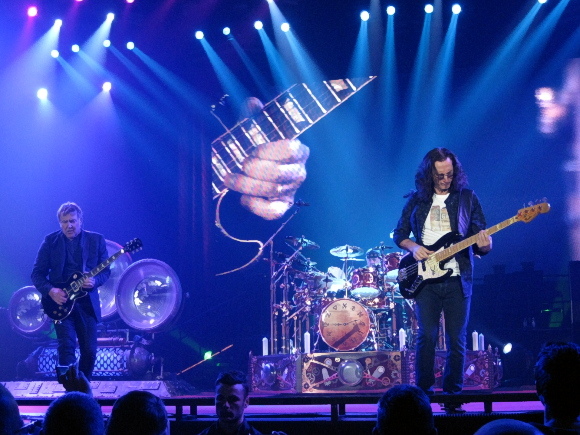 But La Villa Strangiato, the exquisite 1978 instrumental which has been a concert highlight throughout their career would have gone some way to restoring the balance; so would the R30 Overture – the instrumental medley of classic Rush tunes that the band prepared for its 30th anniversary tour in 2004. I suspect that they find it difficult these days to relate to their very best work, sadly. It felt a little like self-denial; almost an attempt to rewrite history. Nonetheless the band has some brilliant post-’70s material in its canon without a doubt, and thanks to the strength of the new stuff in the second set, it was actually overall the most consistently strong Rush performance I’d seen since the Hold Your Fire tour in 1988. Songs from the new album really came to life in a live setting, powerfully supported by the Clockwork Angels String Ensemble, sawing away at their instruments with verve and gusto. I thought that The Anarchist and Clockwork Angels, enhanced by a powerful light show with moving screens, were especially stunning. A couple of crowd-pleasing classics, YYZ and The Spirit Of Radio were rolled out to finish off the second set, then after a rousing Tom Sawyer, the boys knocked out an energetic, yet somehow slightly perfunctory and certainly highly abbreviated rendition of 2112, their only nod to the first chapter of their career. Ah well – yay! It was, in the end, despite my reservations and a sense of an opportunity missed, a brilliant gig. I left the arena feeling content, and after chatting for a minute or two to a clutch of Rush pals I’d run into outside, walked back to the hotel. I’d had a thoroughly good time. And I’d ticked the box! Still got the set. I encountered another pleasing selection of Rush comrades in the hotel bar, and chatted with them for half an hour or so, over a packet of crisps and a couple of Irish whiskies. I’m something of a legend in the Rush fan community – “Rush fan royalty” is the term I normally use – so it was rather nice for them, I thought, to be able to make a memorable evening just that little bit more special by meeting up with me. I was pleased for them. I retired to my room, made use of the hotel’s rather stingy free half hour of WiFi to post a one-line review of the show to Facebook from my Android phone, then made the most of the disappointingly insubstantial quilt provided, and slept. I rose earlier than I’d expected the next day, at about 09:15. I’d taken the whole day off work, so the world was my metaphorical oyster. Manchester city centre was, anyway. I checked out, wandered around a few shops then visited Starbucks for a very nice and very large coffee, accompanied by a croissant. I browsed the shops for another hour or so, then hopped on a tram to Altrincham, where I was reunited with my car. I arrived home in Leicestershire at about 1:30pm. Later that afternoon, as I shared a few more reflections on the events of the previous evening and sorted through the many photographs I’d taken at the show, some of which are shown here – I realised that I had been overcome by a certain “job done” feeling. I had a tenth row ticket for another date on the tour at Sheffield, in a few days’ time, but I just didn’t really feel a need to go. Having already spent a small fortune on the Manchester ticket, the hotel and overnight parking in Altrincham, I thought I’d call it quits and recoup some of my expenses. I put my second ticket up for sale that night, and by the following morning (Friday), it was in the post to a Rush pal. By Sunday though, I had started to feel a bit of remorse. An excellent fourth row ticket was offered that afternoon by a fan who couldn’t now make the Sheffield gig. I jumped on it. In the end, my indecision had rewarded me with a better seat. So it was that at 5pm on Tuesday 28th May, I leaped into my car and aimed it up the M1 in the direction of South Yorkshire. It was a rainy day and the traffic was heavy in places, but I arrived at Sheffield Motorpoint Arena about eighty minutes later. I parked the car there and set off in pursuit of a person called Chris, from whom I had arranged by text message to pick up the ticket. I met him at Nando’s, a short walk from the venue. He was a pleasant young man, dressed in t-shirt and shorts. He asked if I’d seen Rush before. I told him that I had, many times, the first being in 1977. “I wish I’d been born then!”, he exclaimed. I replied that in some ways, I wished I hadn’t. I thanked him and headed for the pub which seemed to have been nominated, slightly uncertainly, as the pre-concert meeting place of the Rush fan community. On arriving there though, I found only one fellow Rush fan, a gentleman named Andy. We had never met before, but recognised each other from photographs posted at various times on the website we both frequent. This was undoubtedly the oddest episode of the whole UK Rush tour story, for me. We had often crossed swords, and occasionally punctured each other with them – and I knew him as one of the most remarkably precious, deliberately antagonistic and unapologetically hostile individuals I had ever encountered on the World Wide Web. Yet in real life, he was thoroughly pleasant – quite honestly as disarmingly charming and personally warm as any Rush fan I’ve ever met. Some people seem to maintain a persona online which is markedly different from their real personality. I don’t really understand it – but each to their own, and I had no doubt after having a drink or two with him that Andy’s pleasant in-person demeanour was genuine. And so the appointed time came, and we made the ten minute walk to the arena. I stopped to chat to a few Rush chums outside, then made my way inside where I encountered a few more. When I got to my seat I was pleased to see yet more familiar faces around me. We chatted, or waved at each other in the distance. Everyone was in great spirits, and I was glad that I’d had a change of heart and made the effort to do a second show. The concert itself was of course essentially the same as the Manchester show, but with a couple of changes to the setlist. The same emphasis on ’80s material was evident but I was delighted to hear two tunes in particular that hadn’t been played at Manchester – The Body Electric, from the 1984 Grace Under Pressure album, and Manhattan Project, from 1985’s Power Windows. The band played with a little more fire and energy this time. 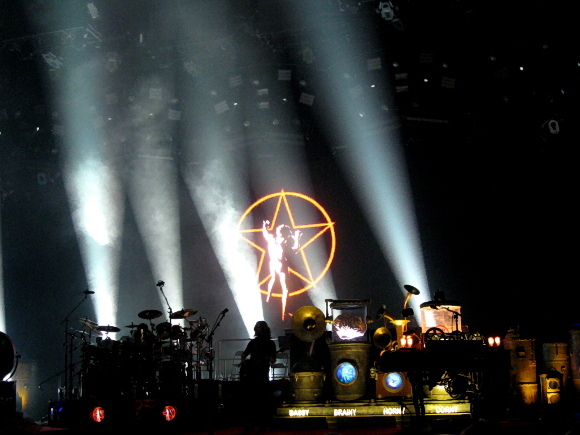 More importantly though there was an atmosphere in the audience that hadn’t been evident at Manchester – a certain shared sense of joy reminiscent of a Rush concert in September 1979 that turned in a sort of quasi-religious experience.. the people raise their hands .. as if to fly! A young lady a couple of rows in front of me was wearing angel wings and flying goggles, in keeping with the Clockwork Angels theme. She was dancing, extending her arms, living and breathing every second of the show. Her obvious joy and enthusiasm made the experience a bit more special, whenever she caught my eye. It was over all too soon. I had a feeling during the concert I attended in Newcastle on the 2011 tour that I might be seeing my favourite band for the last time, and I remember thinking that it would be a good way to bow out of my Rush concert-going career – in the town where I first saw them as a teenager. But I could never have anticipated that they would release an album as strong as Clockwork Angels a year later, and I’m glad to have had a chance to see them again, not once but twice, thirty-six years after that memorable night in 1977. And who knows? Perhaps it won’t be the last. Hi James, very much enjoyed your rush tour experience. I’m not quite the wizened rush fan like your goodself, i first heard rush at the backend of 77 when a friend was handed A farewell to kings and told it would be to his liking. Four of us sat down in his front room and wondered what on earth we were listening to as the acoustic guitar went on and on at the start of the title track, was greensleeves on next? Of course it was a false alarm as it kicked into life and we sat there spellbound and hooked! From then on we were on a quest to track down the back catalogue(not that easy in those days as i’m sure you’ll remember) then the joy of the new album that was hemispheres and the tour that followed, our first chance to see them live. I can still recall the sheer excitement as the hammersmith odeon beckoned, a regular haunt, stablemates Max webster were superb(more trips to london for yet another back catalogue) and rush were like no other band i’d seen, just three guys making this wonderful noise without the tecnological wizardry of todays, as you say, shows! Quite simply the best three musicians i’d seen, which still holds true today. More great albums and gigs followed, the last being Hold your fire at wembley arena, then marriage, children and a mortgage put paid to concerts(not albums) until 2011, yes thats a huge wait!! so the excitement as i made my way to the M E N arena was that of the eighteen year old a few decades before. As you say, it’s now a show, with all the gimmicks which that entails though i did enjoy the opening and closing videos. All in all i thought it was excellent, a good range of songs from all the decades. Perhaps i thought it might be the last time i would see them live, it’s something i’ve never worried about before with any other band but as we know theres no band like rush, no fan like a rush fan, people not in the know don’t get it, why all this fervent ardour for one band and to be honest i haven’t got an answer for them, i’m just glad i love this band, if they can’t see it ,well, i feel sorry for them. 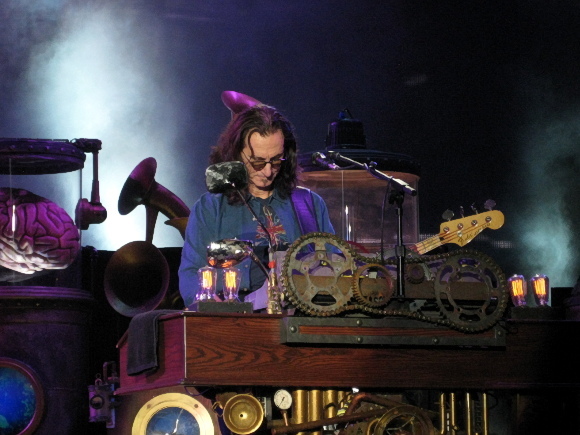 Clockwork angels was a gift from the gods, not only the best rush album in decades but the best album from anybody in a long time and the tour that followed was a nobrainer for me, strong new material(with string section, which was a triumph in my opinion) and a good array of eighties songs. So off again to the M E N, more videos(nowhere near as funny) but still three guys at the top of their game. The new material was as good as i’ve heard from any band in a long while, i remember getting quite emotional during the set. The only downpoint was no”la villa strangiato”, a personal favourite, but i know it must be difficult for a band with such a huge back catalogue so i shall fogive them, i just hope that will see them play it again. I have high hopes i will, they seem to be enjoying recording and playing live as at any other time in their career, it’s only the health issue that might say otherwise. 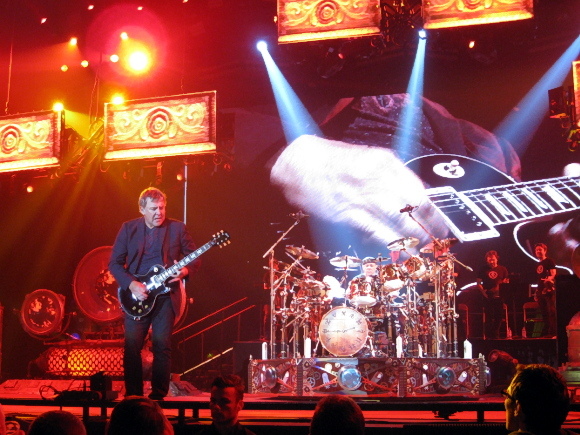 Perhaps it’s the fact that we will miss them terribly when they do call it a day that keeps us going to see this amazing band time and again, there are other bands in the world but no one like rush! regards, Richard. Very much enjoyed hearing about your Rush memories, Richard – thanks a lot for taking the time to post a comment! I hope you had “tongue, firmly in cheek” ? wow …….